As modern athletes push the boundaries of their sports further every day, safety has become their biggest adversary, not ability or imagination. The rise in popularity of foam pits has been the solution to that issue for many extreme athletes, allowing the safe practice of new and daring tricks. And for less extreme uses, foam pits have also become popular with children in indoor playgrounds, gymnasiums and activity centers. Whether you’re looking to build your own test pit or need to refill an existing pit, with their knowledge, material selection and manufacturing capacity, The Foam Factory is the answer to the question of where to get foam for a foam pit. Materials are available in two different varieties; custom cubes for large-scale and professional installations or foam scraps consisting of many shapes, sizes and foam types for more recreation-based entertainment. By utilizing polyurethane foam for pit filler, many different foam densities are available for use, whether a soft, padding foam material is wanted, or a firm, resilient foam is needed for foam pit blocks. Besides the foam types available, multiple foam colors are another option offered by The Foam Factory. Aside from standard charcoal, 11 other colors are available for creating pit foam in one solid color, two or three colors to fit the scheme of an area, or all of them at once for a bright, rainbow-colored pit. The Foam Factory’s colored foam products are also flame retardant, which is a very important feature for pits where motorized vehicles like dirt bikes or ATVs will be using the pit for trick experimentation. It is important to note that flame retardant is not the same as fireproof. 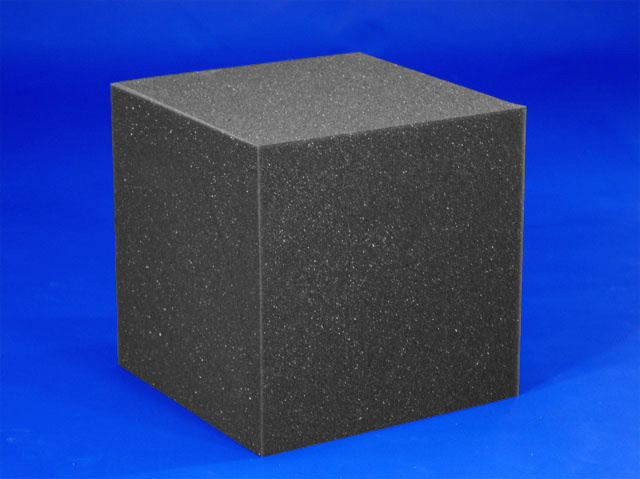 Impact absorbing foam cubes can be manufactured as tiny as 2 cubic inches for light, recreational use, all the way up to 1 cubic foot blocks, the most frequently used size for extreme sports pits where people are landing in the foam with vehicles at high speeds and from great heights. For an economical alternative to the foam blocks, The Foam Factory also provides low impact foam scraps that can be used for foam padding to soften and fill pit areas that receive less acrobatic use. These bags contain about 12 cubic feet of multiple types of open-cell foam. However, being called scrap does not indicate that the foam is of lesser quality. They are called scraps because they are top-quality foam remnants from other products that are in shapes or sizes that do not allow them to be turned into another end-product. 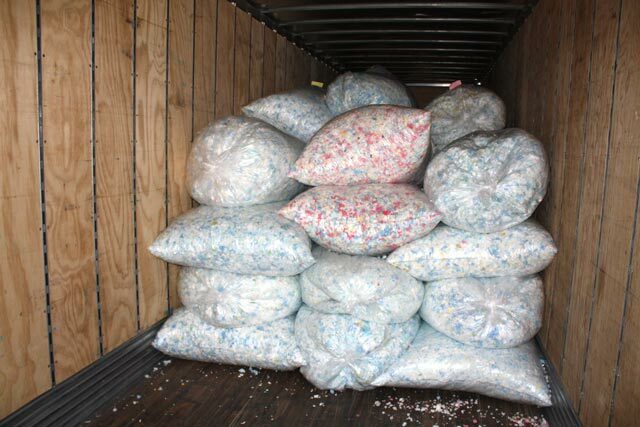 Foam scraps contain the same foam used in mattresses, pillows, acoustics and other The Foam Factory products. With their warehousing and production capacity, The Foam Factory is able to affordably produce both short-run and bulk orders. Whether it’s a couple bags of scrap foam or as many as 50,000 foam blocks for the biggest custom pits, you can get the quantity you need at a price you can afford. Large orders of scrap foam can also be ordered, and bulk discounts are available for both filler varieties. Gymnasts were some of the first athletes to utilize foam padding pits to try new moves, practice safely and perfect their craft. In recent years, skateboarders, rollerbladers, motocross and BMX riders have adopted them as a way to try out tricks that just a few years ago were considered too dangerous to be possible. And on the lighter side of things, getting to fall into a soft, cushiony pit filled with foam is something both children and adults alike delight in. Whether your use is included in one of these categories or you have the next great use for a foam pit in mind, The Foam Factory has the right materials to keep you safe, comfortable and happy. NOTE: This information is provided at your own risk. The Foam Factory will not have any liability to anyone for incidental or consequential damages or any other liability, injury, loss or damage arising out of or related to our products, even if The Foam Factory or an authorized representative of The Foam Factory has been advised of the possibility of such damages. I am interested in purchasing bulk foam block. Yes we can sell the foam blocks in large quantity. Please reach out to our sales team for assistance. Thanks! We can custom make that for you. Please contact us for details. I like to know how much the biggest bulk foam block sheet you can get. I need something that is 4″ thick that’s resistant to wear but not to soft something that will hold its shape. Thanks. We can cut 4 foot cubic blocks. Please contact us for further details. Can you make custom shaped foam pit shapes? I would be interested in finding out if we can do red circles. Not spheres. And in 3-4 different sizes. 3″, 6″, and 9″. Please….! Yes, we can do that for you. Please contact us for pricing and availability. I am need of 27″x27″x18″ foam blocks. I am doing a project and will use these each to sit on. Can you do and what is the cost for each? Please contact us directly for more information. See our contact us page for our phone and email address. I need 100 12″ cubes and I am wondering what the cost would be to purchase them. We actually have something similar to your request. Please see the “Blocks” product at the bottom of our acoustical corner solutions webpage. You will see 12″ blocks, the pricing, and different colors that we have available. Could you please tell me if you would be able to custom make different foam pieces for a pit? Could you make the pieces into different sized tires made out of the foam? We should be able to do that for you. Please contact us for details and pricing. I’m looking for a remnant that could be placed on my piano bench so I could sit higher. Can you recommend anything? Thank you. For your application I would suggest our closed cell foam Neproene Regular. What we suggest is Lux-HQ foam if you want firm and HD36-HQ foam if you want medium.